@Warlord: probably cause his name will give 1000s of results on google and afaik he was never interested in C64 scene/gamer stuff. -the Ghadaffi mentioned in the scrolltext is not the Libyan dictator, but a scener from Berlin who picked that nick. -Paradroid'90 is an Amiga game from.. 1990! you played the plainly named Paradroid on your 64. This intro amazed me a lot, catches the underground computer spirit of the 80s perfectly. A great intro from a great group!!! A true classic, this one. This one rules, the music fits perfectly. Releases have been always clean. I was a "Street Sports Basketball (Epyx)" and "Grange Hill" fan. Alien or CJW: Are you still in contact with Software Invasion Berlin (SIB)? was great 2day 2 meet u guys in Berlin...respect to the plutonium crackers ! Never getting out of style. I remember a different version of this one in front of "Chameleon". And another cracktro for "Oink". Have to take a look at my old stuff sometime. This Intro has a nice spirit...cool, short and dark!!! The "colors" are very clever selected, respekt. Greetings to Alien, CJW,Don and CPU the funny punk. It's 17 years now, but I'm still drunk. We did name ourself Northern Lights on the AMIGA, that is correct! And the legend continued! If anyone who reads this, used to swap with me! Please e-mail me! I´m looking for old contacts! Greetings to all back then from ZZAP OF SCC! It's too bad about Danish Gold. The Danish Gold guys have spend a respectable time in scene. For me they are old school as this real short intro. From a time when quality cracks had to be short. I also remember the SCC cracks. Watching them made me sure all in SCC where color blind :) Only joking, don't be offended. SCC was Northern Lights on amiga? ... cool things worth seeing! Att: AnTiTraX 2010 / Alien!!! Great to hear that you & especially Matthias is still kicking! Please could you send me an email!!! It would be great to get in touch with my old friend again!!! If anyone else sees this, please tell Alien to get in touch with me, e-mail in the header! This loop doesn't have to be a rip from a game. Think they did it in 5 minutes. I just discovered this "music" was used by Electro one year later in his "Gunrunner" cracktro. Does anyone know where it originates from? At this time scene was high-class. Greetings from your alltime friends. Time Warp - I was 15 years old! Haven't seen this for a very long time. I used to love the spacy music loop. A 2K Cracktro is a good explanation for short versions. 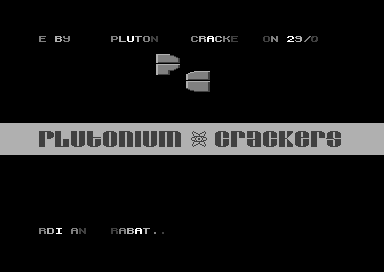 Will have to search my old stuff, there have to be some different Plutonium Cracking-Intros. I am so sad about Danish Gold. Remembering me the eighties, the all-time scene period. A 2K shortie for short cracks. CPU is still alive and kicking. Actually he got back to Berlin some years ago. Cheers to all ancients on a black day. Danish Gold closed down their group after 20 years. can anyone confirm if they were actually from berlin? Anyone know´s where Matthias is today?